Tarboosh Lebanese Cuisine. Just past Subway on the left. 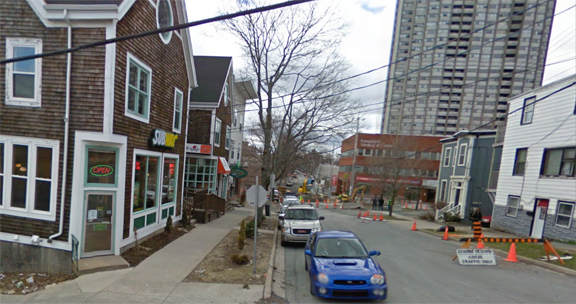 Fenwick Street, Halifax. There’s a hidden gem of a restaurant around the corner from our house called Tarboosh Lebanese Cuisine. Relatively new in the neighbourhood, they have the most amazing food, including freshly made humus, wraps, salads, platters and dips. Prices are reasonable, many individual items being under $10. It is a favourite place for us to go when we have a Lebanese craving. The service is fast and friendly, and we have always found the food to be exceptional. It's just around the block, and right by the local Sobeys grocery, so you can place your order, do your nightly groceries, and then swing back up to pick up your dinner. Reviews from other patrons are also positive and they have been recommended by the local free weekly, The Coast. With dine-in and take-out, they’re a great place to grab dinner if you’re too tired to cook. Did I say they were now licensed? Among many menu items, they also offer Shish Taouk, which is where I first experienced it in wrap form. At Tarboosh they also add seasoned potato wedges (much like hash browns but bigger) in the wrap. Fries are also a normal accompaniment on a shish taouk plate. Shish taouk is a traditional dish in many Middle Eastern countries including Syria, Iraq and Lebanon, among many others. Its main ingredient is chicken which is commonly marinated in either a yoghurt or tomato based mixture. 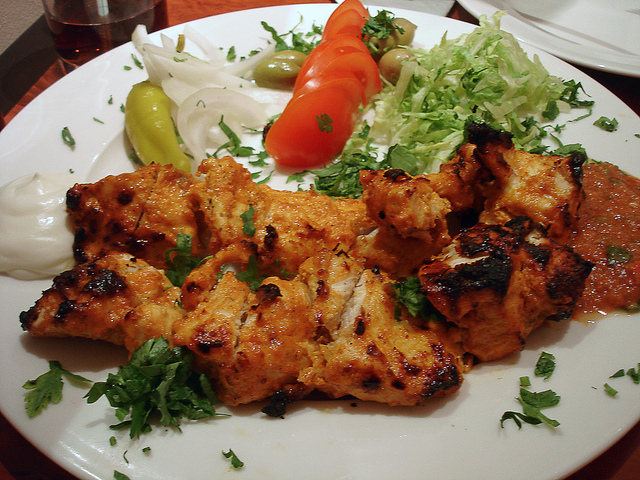 The marinated chicken is then skewered and grilled, imparting a smoky flavour on top of the spice. It is most commonly served with a garlicky sauce called toum and rice and vegetables on the side. If you haven’t had toum, you should try it. There is a “modern” take on the original where a wrap/sandwich is made from the chicken, lettuce, tomatoes, toum and pickled turnips. There obviously are recipes for pickled turnip on the Web, but they take a few days, and make quite a lot. It is probably best to purchase a jar or can from a specialty Mideast store. This recipe does not require grilling, but substitutes broiling for very close to the same effect. You could grill if you wished. The toum is quite easy to make if you know how to make mayonnaise (from my earlier post). 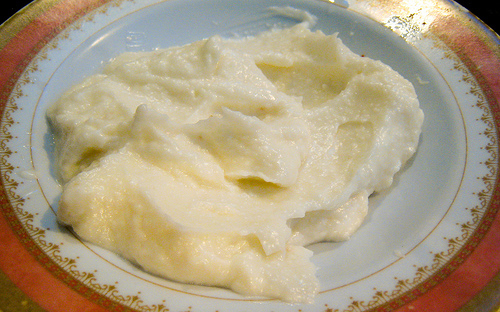 Toum is essentially a lemon garlic version of mayo. Quite tasty and full to bursting with garlicky flavour. Homemade pitas have a hollow centre that you can open up and fill. Marinate the chicken breasts for 2 hours on the counter, or overnight in the refrigerator. After marinating, place on a grill rack and grill the breasts on both sides until done (as desired, but don’t dry them out!). Cut into pieces. To make the Garlic Sauce, place the garlic, salt and egg white in a blender. Blend until smooth (or very nearly smooth). Add the lemon juice and blend well. Remove the fill cap on the blender. While the blender is running, pour the olive oil in a thin stream into the mixture. As you slowly pour it will whip. Add enough oil to make the mixture the consistency of mayonnaise. 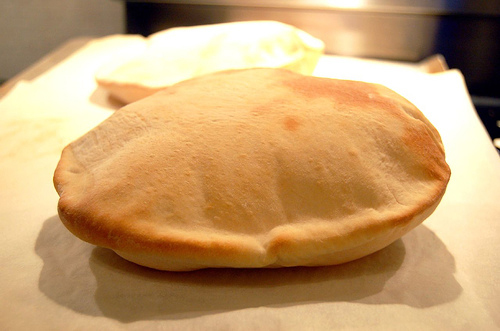 To serve, separate the pita into its two layers to make a pocket. Open each pita up like a butterfly with one edge still attached. Place chicken, romaine, tomatoes, parsley and garlic sauce on one half of the opened pita. Top with some additional cumin and oregano if desired. Fold the other half over and roll up tightly. Secure with a toothpick.